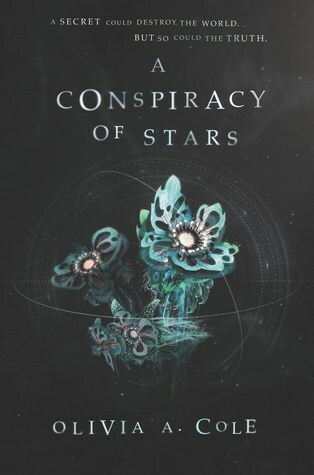 This week on WoW is A Conspiracy of Stars by Olivia A. Cole. I don't know if it has already happened to you but: I'm not really fond of the synopsis of this book, however there a few details (as a magical jungle) that just appeal to me, making me think that maybe you shouldn't read a book by it's synopsis. 😋 Does it make sense? Also, the cover! *. * I just love the minimalistic style and colours chosen. The book will be released on January 2nd 2018. "Octavia has only ever had one goal: to follow in the footsteps of her parents and become a prestigious whitecoat, one of the scientists who study the natural wonders of Faloiv. The secrets of the jungle’s exotic plants and animals are protected fiercely in the labs by the Council of N’Terra, so when the rules suddenly change, allowing students inside, Octavia should be overjoyed. With the help of Rondo, a quiet boy in class with a skill for hacking, and her inquisitive best friend, Alma, Octavia is set on a collision course to discover the secrets behind the history she’s been taught, the science she’s lived by, and the truth about her family." I agree with you about not always judging a book by its synopsis. I've read terrible synopses that ended up actually being great books and the opposite too, the synopsis sounded fabulous but the book ended up being a DNF. This one sounds pretty interesting though. I like the focus on science. Hope you enjoy it! I think this book cover looks like a lot of other ones out there. However, I am also intrigued by the magical jungle aspect. I'm not ruling it out yet but would like to see some reviews before I dive in. The jungle aspect sounds interesting, and I like that the main character is a girl who wants to be a scientist. Hope you enjoy this one! The synopsis has me scratching my head a little, but there are some things that definitely caught my interest. Prestigious whitecoat (tell me more), who protect the secrets of the jungle (why is that), and a girl who along with her hacker and curious friend will discover the secrets. Sounds very intriguing. I've been hearing about this one, sounds like it could be good. And a beautiful cover for sure! Great pick! I'll have to keep my eye out for this one, it definitely caught my attention. Enjoy it! This sounds like such a great read! Thanks for sharing it! I am also waiting for this book, and I really love the cover. Thanks for sharing! Nice, my wishlist just grew a bit. Thanks! *lol* The cover looks amazing, thanks for sharing and happy reading.